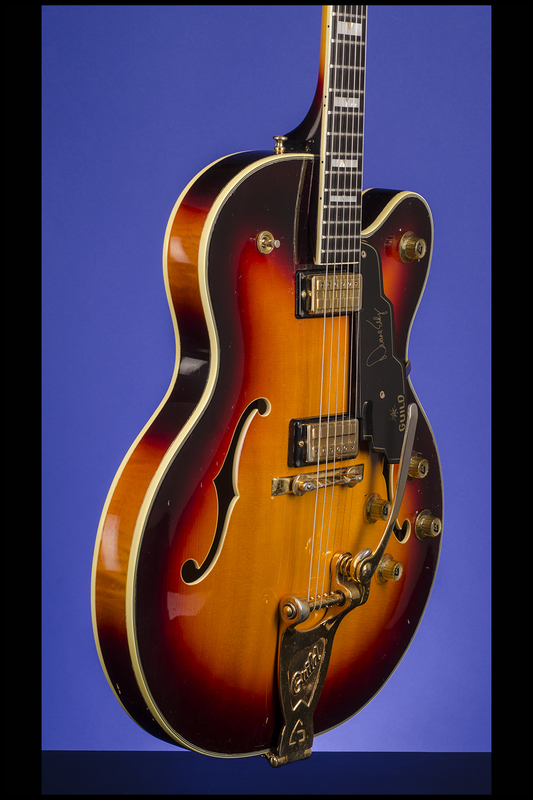 Duane Eddy-500 SB Guitars | Fretted Americana Inc. 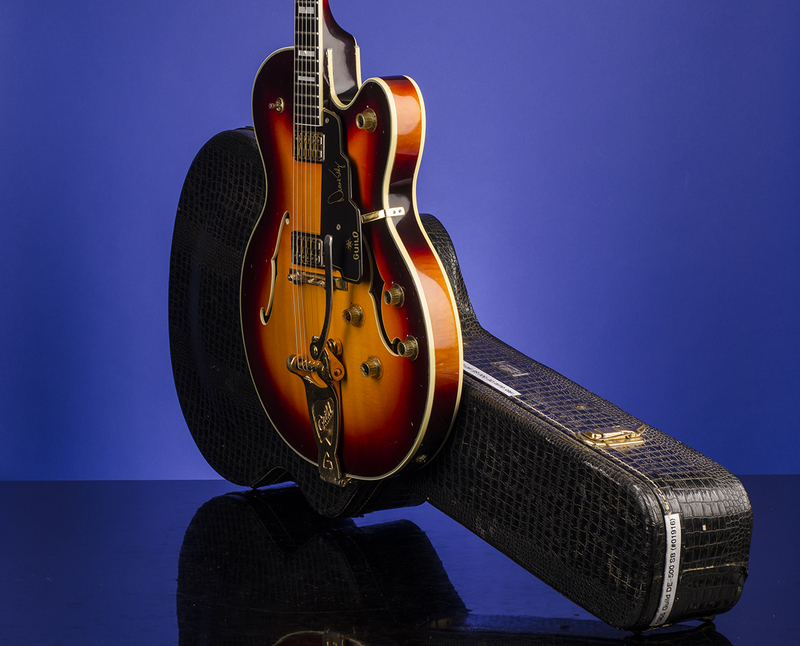 This near mint, early 1965 Duane Eddy 500 Rock'n'Roll Guitar weighs just 7.00 lbs. 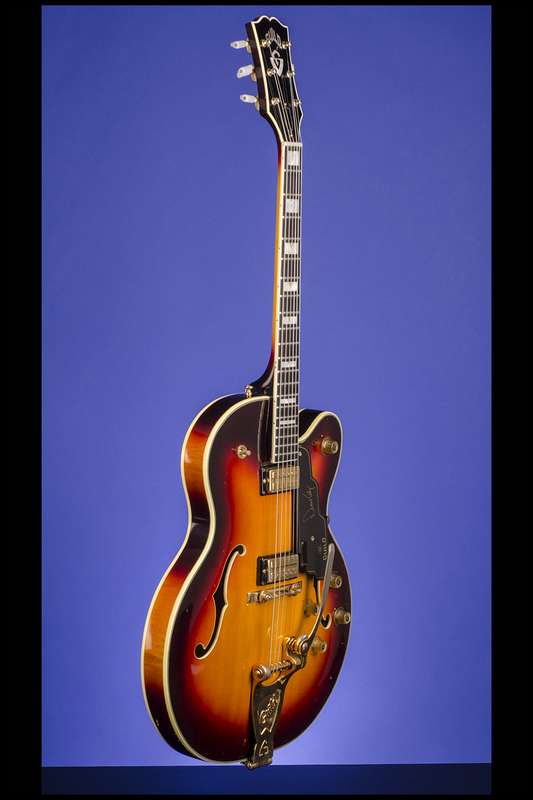 Seventeen inch-wide, 1 7/8 inch thick, semi-hollow body with a close-grain spruce top, highly-flamed maple back, and curly maple sides. Three-piece maple/walnut/maple neck with a nice, fat nut width of just under 1 11/16 inches, a scale length of 24 3/4 inches and a wonderful medium-to-thick profile. Ebony fretboard with 20 original jumbo frets and inlaid pearl block position markers with abalone "V" inserts. 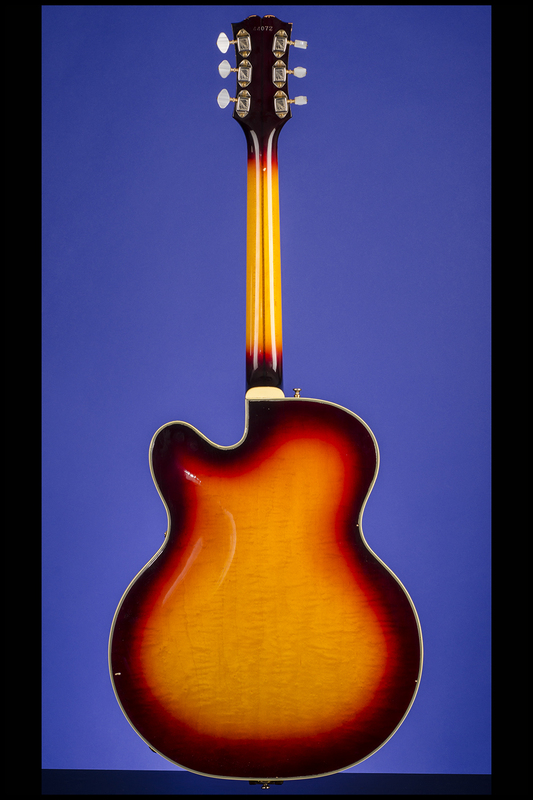 The top and back edges have five-ply binding, the f-holes are single-bound, and the headstock and neck are single-bound. "Lip top" headstock with inlaid pearl "Guild" logo and pearl "G-shield" inlay. Black plastic shield-shaped truss-rod cover with silver 'shield' outline. Individual floral-engraved nickel Kolb-made tuners with diamond-shaped 'stepped' pearloid buttons. Serial number "44072" stamped in blind on back of headstock. Two Guild 'Anti-Hum' pickups with outputs of 7.32k and 7.09k and black plastic surrounds with height-adjustment. Earlier-style rounded transparent acrylic (or Lucite) stairstep pickguard painted black from the back after a gold silk-screened "Star", "Guild", and "Duane Eddy" signature have been applied. Four controls (two volume, two tone) on lower treble bout plus master volume control on upper treble bout and three-way pickup selector switch on upper bass bout. Guild clear plastic knobs with G-logo on a gold disc. 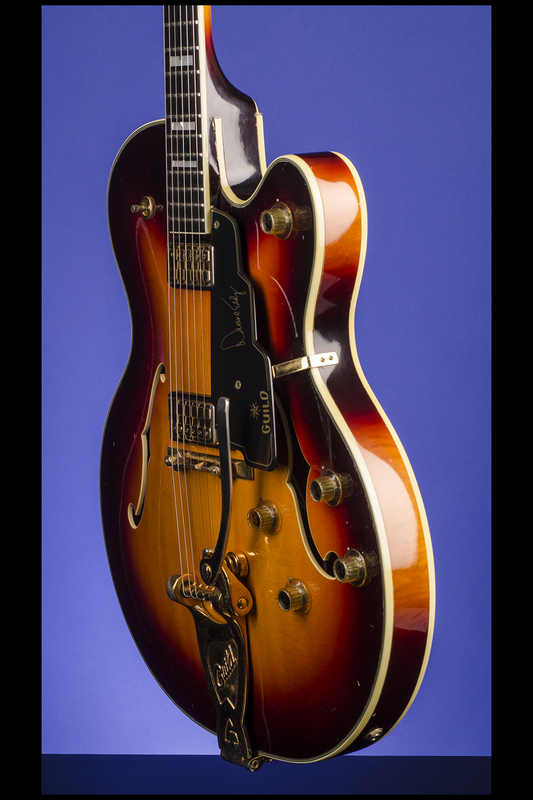 Guild aluminum bridge with pre-set compensating saddle and Guild Bigsby Vibrato tailpiece stamped on the underside ""Bigsby/Patent/No. D-169,120". Serial number "44072" and Model "Duane Eddy-500" written in ink on oval white Guild Hoboken, New Jersey label inside bass f-hole. All hardware gold-plated. 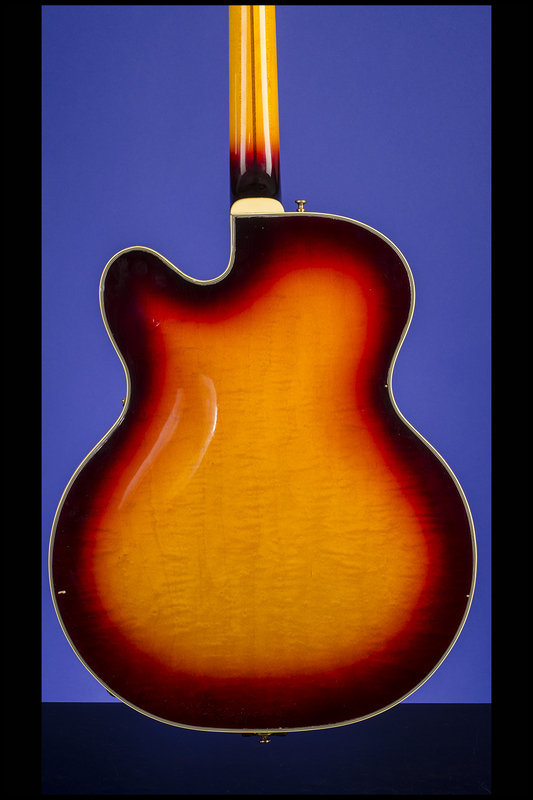 A few tiny surface marks on the top and lower edge of the body and one small surface mark on the back of the neck just behind the first fret are all that prevent this amazing example from being mint. There is a very small amount of wear to the original frets which is confined to the 'B' and high 'E' on the first five frets. Complete with the original Guild, Hoboken, New Jersey. warranty hang-tag with matching serial number in black ink. Housed in the original Guild five-latch, shaped black 'aligator' hardshell case with burgundy plush lining (9.00). This guitar is one of just 107 DE-500's made in 1965, the majority of which were apparently blond. 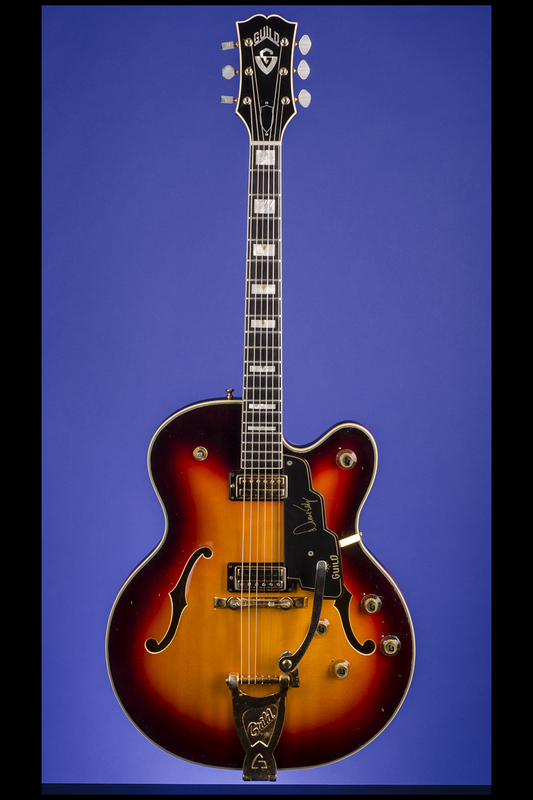 "Duane Eddy's 'twangy' guitar sound, which he got from a Gretsch Chet Atkins Hollow Body, made him the most popular solo guitarist of the late 1950s. In 1961 he sought his own endorsement deal, and Guild was the first company to show interest. 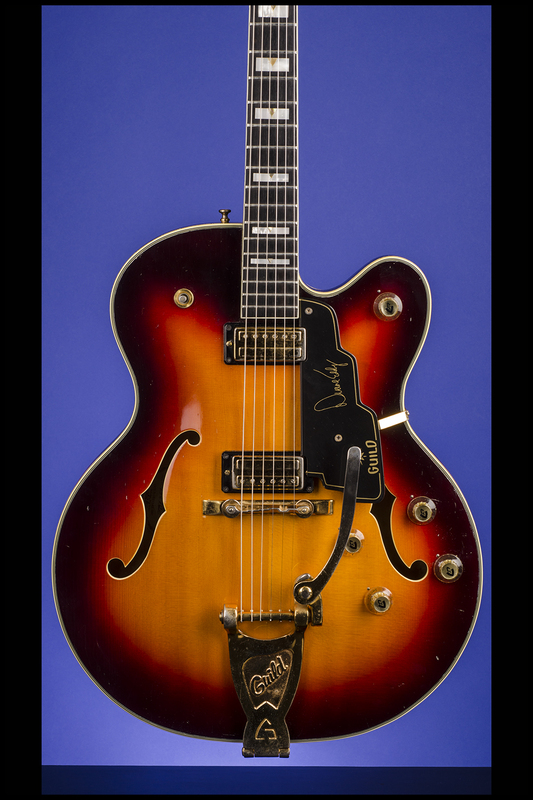 The Duane Eddy model was based on Guild's T-500, a limited-run thinbody version of the Stuart 500 archtop. 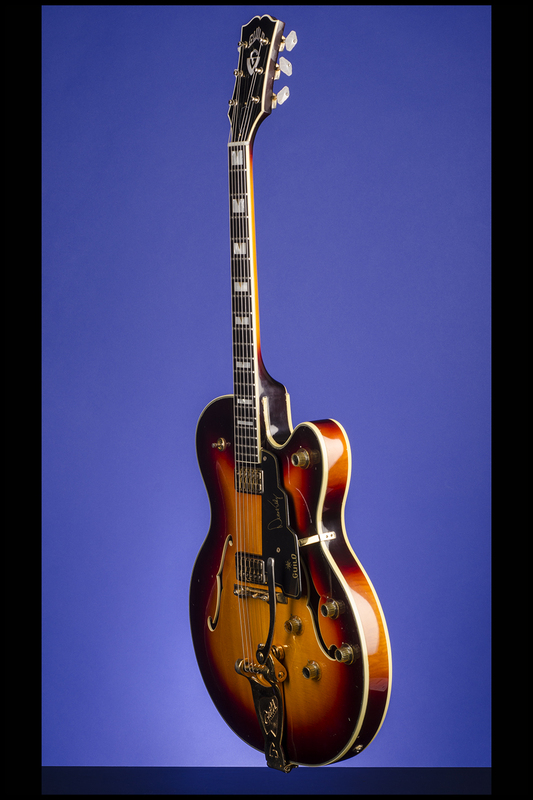 Eddy specified two features from his Gretsch: Bigsby vibrato and master volume control on the cutaway bout. Examples from 1962 and 1963 have single-coil DeArmond pickups; Mini-humbucking "Anti-Hum" pickups appeared in late 1963. 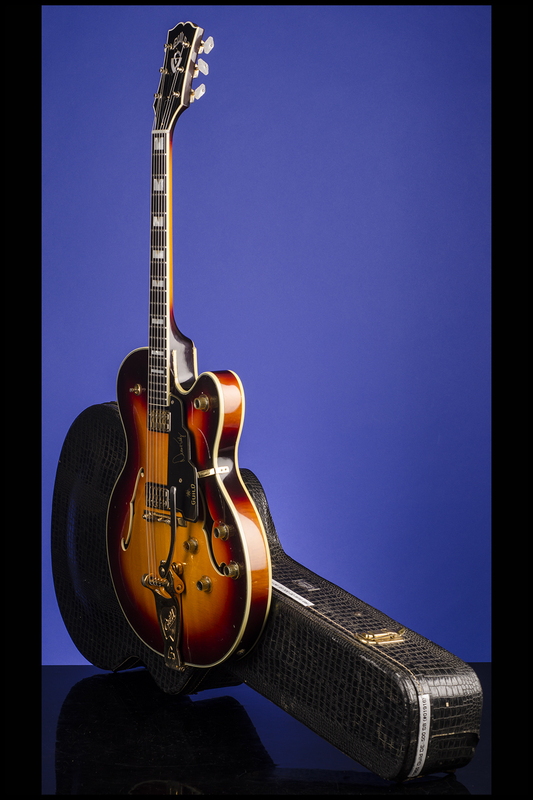 The DE-500 was last made in 1969 but was reissued in 1983" (George Gruhn and Walter Carter, Electric Guitars and Basses: A Photographic History, p. 235).